You asked for it… and now it’s finally here! 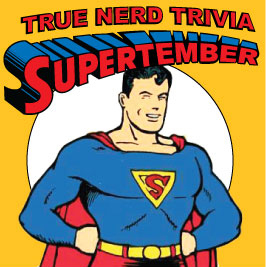 A whole trivia event dedicated to those costumed crusaders we love so much: Superheroes! The usual drinks, fun and PRIZES are as fabulous as ever. And of course, there is THE PIE to be won! Who will become True Nerd Trivia’s next champions? Join us and find out! For more information and regular updates “like” our Facebook page! Previous post: 33 Games Submitted so far… Recess 10/8/11! Next post: Resurrect Dead – What does it all mean?